Fall 2014 College of Engineering Design Showcase, which features capstone design projects, first year design projects, and other groups. The event is attended by many members of the university, the industry and the public. 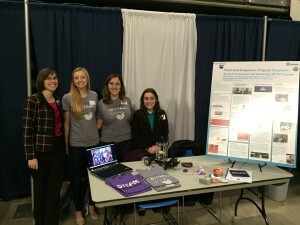 Dr. Mary Frecker, Kara Springsteen, Sarah Masters, and Sarah Dangelo (left to right in picture below) attended the event by showcasing origami research as part of the REM program. For more information, please visit: the PSU news story. Congratulations to Adrienne Crivaro on winning an award for her research work at the GE research summit! EDOG Lab member Jennifer Hyland won an award for the “Best Interactive Presentation” at the Compliant Mechanisms Symposium at the ASME IDETC in Chicago. Penn State awarded EFRI-ODISSEI Grant. Read the full story. To learn more about all the EFRI projects click here. EDOG lab members Yash Tummala and Brittany Murphy with Open Design Lab member Charlotte de Vries won “Best Design Process” for the Iron Lion Design Challenge 2012 Part 1. EDOG lab member Yash Tummala won third place for “Design and Optimization of a Compliant Spine with Tailorable Nonlinear Stiffness.”Read the full story. EDOG lab member Melissa Buydash received a National Science Foundation (NSF) Graduate Research Fellowships. She will be attending MIT in Fall, 2011. Read the full story. Dr. Timothy Simpson wins Fred Merryfield Design Award for his extraordinary leadership in engineering design. Read the full story. Penn State produces a video on Dr. Mary Frecker’s work in advancing surgery using mesoscale instruments. Read the full story. EDOG lab member Yash Tummala was a finalist for the best student paper award in the Bioinspired Smart Materials and Structures Symposion at SMASIS 2010. EDOG lab member Samantha Cirone receives The Gabron Graduate Fellowship in Mechanical Engineering. Read the full story. EDOG lab members Milton Aguirre and Andrew Rau presented posters at the Design of Medical Devices Conference in Minneapolis. Terry Johnson wins first place in the paper competition at the SPIE Conference. Read the full story. Laura Slingerland, Nathaniel Troupe and advisor Leland Engel, display their eco-marathon car at the World Business Forum in NYC. Read the full story. EDOG lab members Cassie Niebel and Andrew Rau place at ASME Design Competition in California. Read the full story. Milton Aguirre is awarded the Kulakowski Travel Award for the 2009-2010 academic year. Read the full story. Dr. Tim Simpson has been elected a Fellow of the American Society of Mechanical Engineering (ASME). Read the full story. A paper authored by Dr. Mary Frecker, Dr. George Lesieutre and Vipul Mehta has won a best paper aware from the American Society of Mechanical Engineers (ASME) Aerospace Division. Read the full story. MNE student Cassie Niebel is honored at the 2009 senior recognition banquet. Read the full story. Dr. Tim Simpson has been elected an associate fellow by the American Institute of Aeronautics and Astronautics (AIAA). Read the full story. Dr. Mary Frecker has been named a fellow of the American Society of Mechanical Engineers (ASME). Read the full story.